UEFA have performed a U-turn to allow John Terry to get his hands on the Champions League trophy should Chelsea beat Bayern Munich next month, but it is unclear if he will lead the side up to collect it. 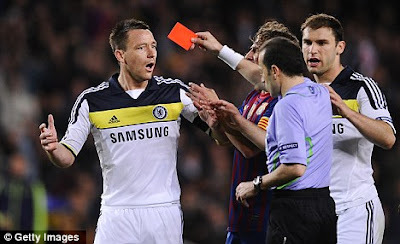 Terry, sent off in Tuesday's semi-final win in Barcelona, will be unable to sit on the bench in Munich and will have to watch from the stands, along with Raul Meireles, Ramires and Branislav Ivanovic, all suspended for picking up yellow cards. Terry was shown a straight red card during the first half of the semi-final against Barcelona when he kneed Alexis Sanchez in the back. Despite the setback, 10-man Chelsea went on to record a famous result as they held the hosts to a 2-2 draw as Fernando Torres struck a late goal to progress 3-2 on aggregate. One would recall that Roy Keane and Paul Scholes did not take part in the presentation ceremony when Manchester United won the Champions League in 1999 because they were banned from the final. And when Barcelona won at Wembley last year, their captain Carles Puyol accepted the trophy and immediately handed it to Eric Abidal to hoist into the air. Abidal had come on as a late substitute after making an emotional return to the team following his fight against liver cancer. UEFA's control and disciplinary body will decide the length of Terry's suspension on May 31. European football's governing body have the power to extend the punishment, which would apply to next season's European Super Cup and possibly early Champions League or Europa League matches.